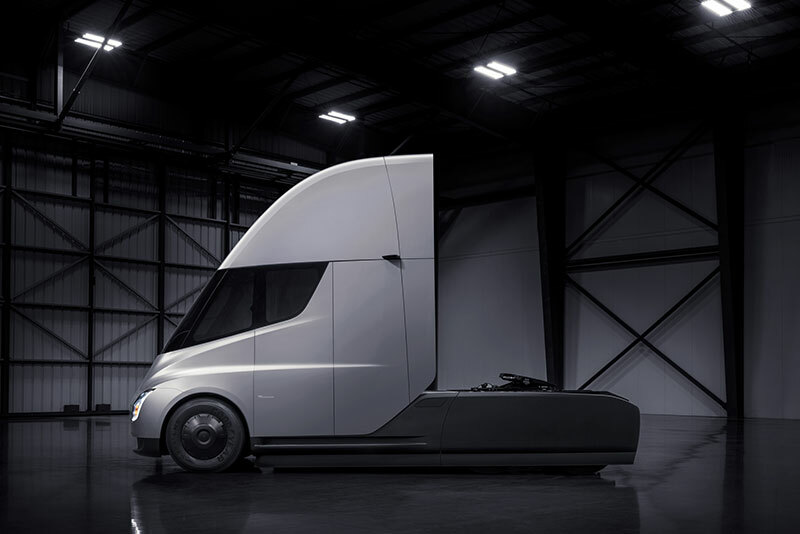 Tesla unveiled its Class 8 electric truck, and while the vehicle Chief Executive Elon Musk touted as a “beast” in a Twitter campaign doesn’t look very beastly, the specifications he shared Thursday certainly live up to the boast. Musk debuted what he called the Tesla Semi in a former aircraft hangar in an industrial area near Los Angeles that houses Tesla’s design center and Musk’s SpaceX rocket company. As more than 1,000 Tesla passenger car owners, investors, potential customers and others looked on, noisily cheering, Musk displayed two prototype trucks, a low-roof model painted a menacing flat black and a tall “aero” model in bright silver. After riding in one of the trucks onto the stage, Musk jumped into the performance characteristics of the vehicle. “We designed the Tesla truck like a bullet,” Musk said. “A normal diesel truck is designed like a barn wall.” The Tesla Semi is more aerodynamic than a $2 million Bugatti Chiron sports car, he said. The aerodynamic design and electric drive train will power the truck, including the trailer, a gross weight of 80,000 pounds, from zero to sixty mph in 20 seconds, about 40 seconds faster than a conventional diesel truck, he said. It is initially designed for short- and regional-haul routes, such as those that run goods from ports to distribution centers, but Musk said a long-haul sleeper cab model is in the works. Fully loaded, the Tesla Semi is capable of 500 miles of range at highway speed, he said. While lengths under that range are generally considered regional, rather than a long-haul, the truck would satisfy many freight requirements. Nearly 80 percent of freight in the U.S. is moved less than 250 miles. The average length-of-haul in the trucking industry has dropped from about 800 miles 15 years ago to about 500 miles last year, according to the American Trucking Associations, a result of port expansions nationwide and the e-commerce boom. On the road, the trucks will be powered by what Musk is calling megachargers, a new high-speed DC charging system that will supply about 400 miles of electricity in 30 minutes. The solar-powered chargers can be installed at origin or destination points such as trucking depots and loading docks and along heavily trafficked routes, he said. “Because these megachargers are solar powered, your truck will be running on sunlight,” Musk said. The megachargers are a future Tesla product and none have yet been deployed. Production begins in 2019, Musk said. The truck features four electric motors, each driving one of the rear wheels. Tesla has not divulged the capacity of the trucks’ Tesla-built battery packs nor horsepower or torque figures. The Tesla Semi is rated as a full Class 8, with a weight rating of up to 80,000 pounds. Tesla’s prototype is all carbon-fiber reinforced plastic, but the company says no decision has been made on the materials to be used for production models. Tesla uses aluminum for most of the structural material in its cars, though, and will likely stick to that and composites for the production truck in order to offset the weight of the battery pack. Use of such material tends to increase costs. In addition to its electric drive system, the Tesla Semi is equipped with a full slate of electronic safety and driver-assistance systems. That’s sufficient, Musk said, to make it fully autonomous when autonomous truck operation on public highways is permitted. The trucks also will be capable of “platooning,” in which one or more digitally tethered trucks automatically follow a manned lead truck to save fuel. Tesla showed two versions of the truck Thursday: A low-roof design and a highly streamlined “tall boy” version topped with aerodynamic fairing and featuring full-body fairings that covered the drive wheels to improve wind resistance. Both prototypes are day cabs. 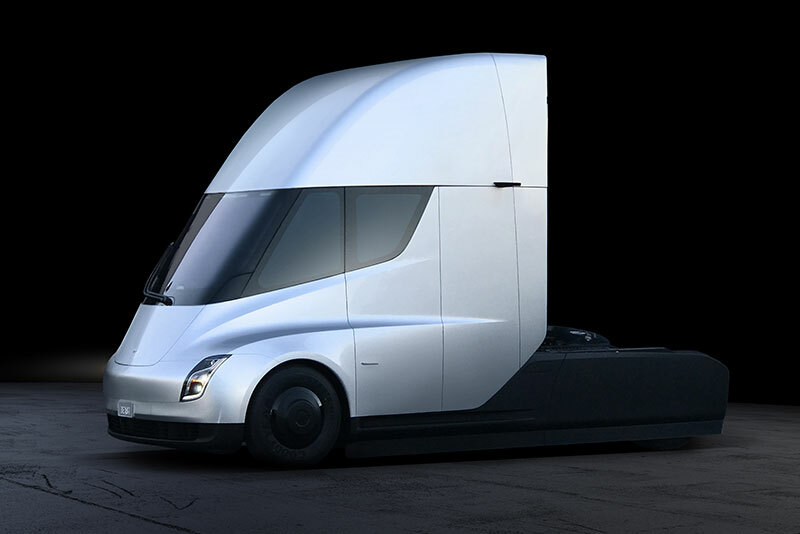 Outside, the Tesla Semi looks more like a sleek panther — or a starship trooper’s helmet as envisioned by Hollywood art directors — than a hulking beast. It is sleek, with few sharp angles or lumpy appendages. The rear of the tractor is all smooth flat planes, no hoses, pumps, tanks or other exposed hardware on view. The wheels are covered with full hubcaps — and the rear wheels are not even visible in the full-aero model. Inside, the cab is modern to the point of austerity. “The driver is in the center of the truck, you are positioned like you are in a race car,” Musk said. The driver seat is centered between a pair of 15-inch information screens — taken from the Model 3 sedan in what Tesla says is a bit of shared-component budgeting. Those touch screens provide access to navigation, blind-spot monitoring and electronic data logging as well as speed, hydraulic pressure and battery system data. Tesla said the truck will offer built-in connectivity to communicate directly with a fleet’s management system to support routing and scheduling and provide for remote monitoring. There is no instrument panel or dashboard. The console, which houses three cup holders, a change dish and a deep covered cubby, is located against the right wall of the cab, between the front end of the door and the rear edge of the windshield; great for right-handed drivers, not so for lefties. The smooth doors — the truck uses Tesla’s signature flush-fit handles — open wide, and access to the cab is via two molded-in steps. A co-driver or passenger is relegated to a jump seat mounted on the rear wall next to the right-side doorway. Ceiling height in the cab is close to 6 feet, 10 inches. Tesla plans to make safety a big part of its sales pitch. The semi’s battery is in a reinforced case between the frame rails and beneath the cab. Because each motor is independently controlled, sensors can detect instability and adjust torque to each wheel to correct pitching and yawing; the brakes can be independently actuated as well. Cameras mounted atop the cab provide a surround view that’s displayed on the touchscreens. Other safety features, all part of Tesla’s “Enhanced Autopilot” system, include automatic emergency braking and lane-keeping and lane-departure warning systems. Electric trucking technology is going to first appear in buses and delivery trucks, such as UPS vans and garbage trucks. These are vehicles that travel shorter distances than long-haul semi-tractors and return to a home base where they can be charged overnight. Heavy-duty electric trucks, such as Tesla’s day-cab model, are likely to enter the market after vans and work vehicles have established a foothold and before long-haul electrics are feasible. “Take garbage trucks. They are heavy-duty trucks, but they go a short distance and there is a lot of stop-and-go traffic, and they always return to the same depot for the night,” Antti Lindstrom, trucking industry analyst at IHS Markit, told Trucks.com. Regional trucks would be the next to employ electric drive technology, Lindstrom said. Trucks such as the recently shown Cummins Aeos truck, and Tesla’s Semi, fit into that category, he said. Tesla still faces much skepticism within the trucking industry, he said. “Tesla has done a very good job in passenger vehicles, making electric power interesting and accessible for consumers,” Lindstrom said. Tesla, however, appears to be banking on putting a lot of that skepticism at bay by hitting the market first with a model that can establish itself as cost effective and reliable competitor. The Tesla Semi will be warranted against breakdown for one million miles, Musk said to cheers from a contingent of truck drivers and fleet operators in the audience. “Even if two of the motors quit, there are two more and it can still beat a diesel,” he said. Analysts at consulting firm Roland Berger estimate that the market for heavy-duty short-haul and regional trucks in the U.S. will hit 15,000 units a year by 2025. Musk said that the nature of electric powertrains, with few moving parts and no transmission of diesel after-treatment systems to worry about — makes them inherently less costly to maintain than diesel trucks. Fuel for electric trucks also is far cheaper than diesel fuel. Musk said Tesla will guarantee a cost of just 7 cents per kilowatt for electricity pulled from a Tesla megacharger. At that rate, compared to $2.50 per gallon diesel fuel and factoring in insurance, maintenance and lease costs, a Tesla Semi driven 60 miles per hour with an full load on a 100-mile route would cost about $1.26 a mile to operate, versus $1.51 per mile for a diesel, Musk said. Financial data company Bloomberg estimates that an electric truck operator will pay about 12 cents a mile on maintenance. That compares with an industry average of 19 cents a mile for diesel trucks. At a national average of 11 cents per kilowatt for electricity used in commercial transportation, a short-haul truck logging 60,000 miles a year would save an operator $4,000 in maintenance and $14,000 in fuel, according to Bloomberg’s estimates. Although Tesla was a pioneer in the electric car market, it is just one of many contenders in the electric truck space. Automotive giant Daimler stole some thunder from Tesla in October by introducing an electric heavy truck prototype that it said could be in production by 2020. Daimler also announced formation of a special unit of its Mitsubishi Fuso truck division, E-Fuso, devoted solely to electrified trucks and buses. Volkswagen also said it plans to roll out electric trucks and buses in a few years and is targeting the debut of a medium-duty model in North America by early 2020 in conjunction with its Navistar affiliate. Others working on electric trucks include Nikola Motor, which is developing a fuel-cell electric tractor-trailer combo; Toyota, which is testing a Class 8 fuel-cell electric drayage truck in Southern California; Chinese-backed BYD, which is building electric buses and Class 6 through Class 8 electric trucks in Southern California; and Kenworth, which is developing a Class 8 hydrogen fuel-cell electric truck it plans to launch early next year. Electric bus maker Proterra also has said it intends to branch into electric trucks. Even diesel engine giant Cummins Inc. is in the game. The company recently showed an all-electric prototype and has purchased battery pack developer Brammo and said its aim is to become “a leading provider of electrified power systems” for the truck industry. Enjoy your slow and weak pollution mobile. We’ve ordered one for trial. Already use electric powertrains for light delivery vans and personal vehicles. The fuel and maintenance savings are real, if not understated. The bulk of what we want to use EVs for is Rigid tippers though and there’s nothing suitable on the market yet. What does it cost? Electric trash trucks run about $650K, while diesel trash trucks cost $250K. The price differential for these units means you will make up the difference in fuel and maintenance savings in 50-60 years or so….hmmm? It will be nice future when these come out. Slow diesels will be gone and a lot of fleet companies are going to get these. Maintenance wise they will save more than diesels.